Birthday evening. Bring on the chocolate cake! Blow out the 28, 32, er, ah, 39, yeah, that's the ticket, 39 birthday candles! "When it is turned onto a cake plate, it covers itself with a thick layer of dark chocolate topping that resembles nothing I can think of. The topping is as dark and shiny as black patent leather, as tender and semifirm as a pot de crème, and as mocha-chocolate flavored as you might weave dreams about." It's remarkably easy to make. And for all it's creamy dark chocolate decadence, it (don't tell the FRE) has about half the fat of a comparably sized brownie. Honest-to-god, you have to give this one a go. 1 Preheat the oven to 350°F. 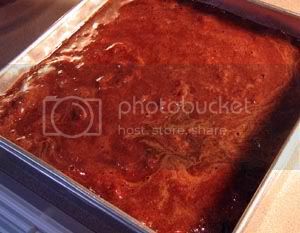 Rub a thin layer of vegetable oil on the insides of an 8 inch cake pan. 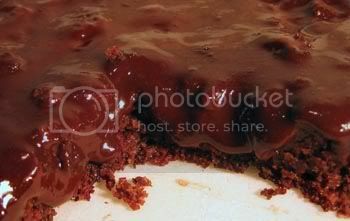 2 Combine all the topping ingredients in a small saucepan and heat at the very lowest setting as you prepare the cake. 3 Sift together the first 6 cake ingredients (flour, baking powder/soda, salt, cocoa, sugar). Melt butter (20 seconds in a microwave should do it). In a separate bowl, whisk together the milk, buttermilk, vanilla, melted butter, and oil. 4 Combine the wet and dry cake ingredients. Stir until completely blended. Stir in the walnuts. Pour into the oiled cake pan. To the right you see the boiled sauce floating on top of the uncooked cake batter. 6 Bake for 40 to 45 minutes or until a toothpick inserted into the middle, no more than 1/4 inch deep, comes out clean. 7 Allow the cake to cool, about an hour. Cover the top of the cake with a flat plate or cutting board, turn over, and tap the bottom of the pan gently (or more vigorously if your cake is stubborn), until the cake dislodges. Some of the topping will stick to the bottom of the pan. Just scoop this up and spread over the cake. Resist licking. Or not.